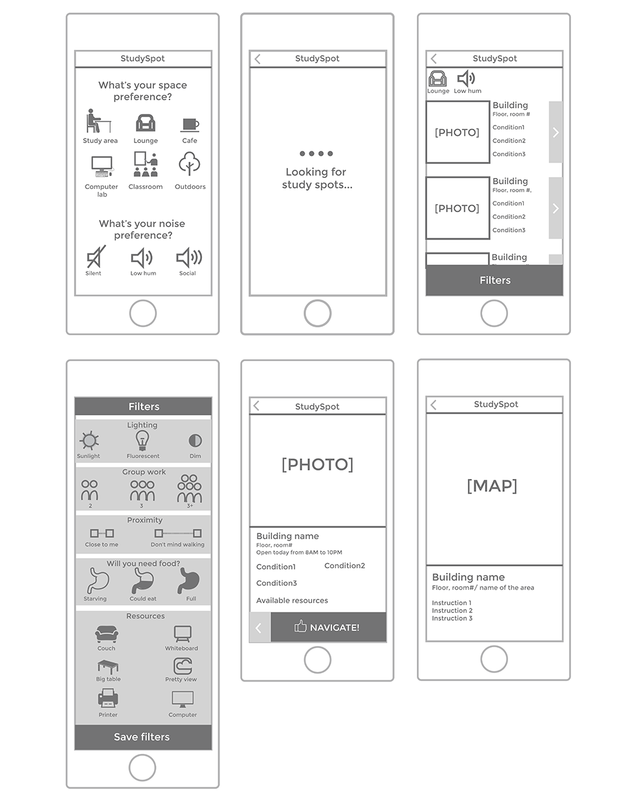 Studyspot was a semester-long app building project spanning the entirety of my sophomore spring semester (January 2015 - May 2015). This app implements HTML5, CSS3, jQuery Mobile, and Google Maps API. Designed for Apple's iPhone 5. Currently fixing domain issues and will have a link to the application up shortly. 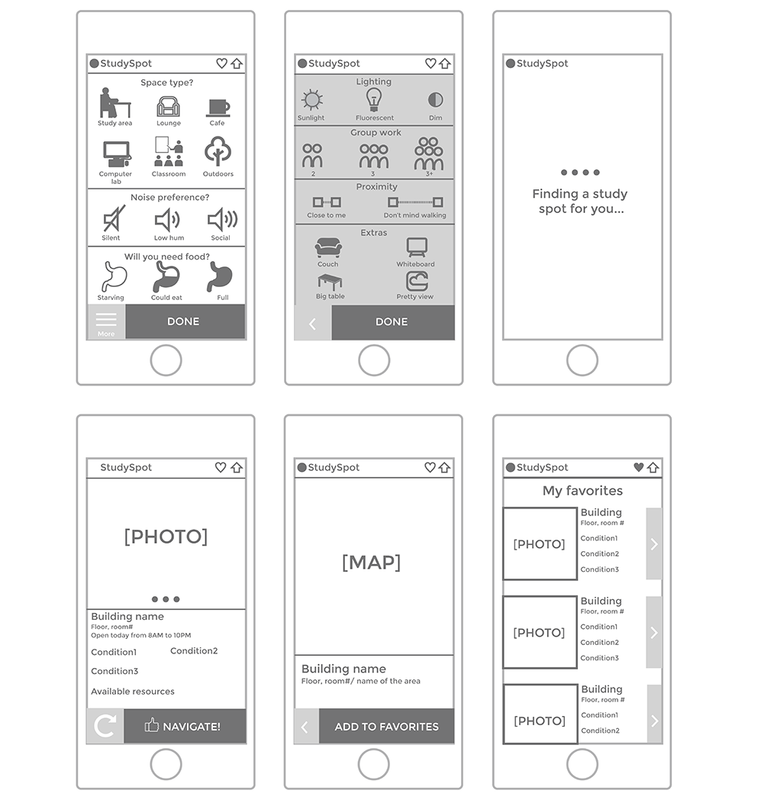 Our app resolves this problem in that it suggests a perfect study spot based on the user's personal preferences. We interviewed multiple students to determine what factors influence their choice of a study place. We found that users care about the type of space (study area for better concentration or lounge for a more social and lively experience). Some other common decision factors were the sound level in the space, available resources, space capacity, a sense of novelty or food availability. 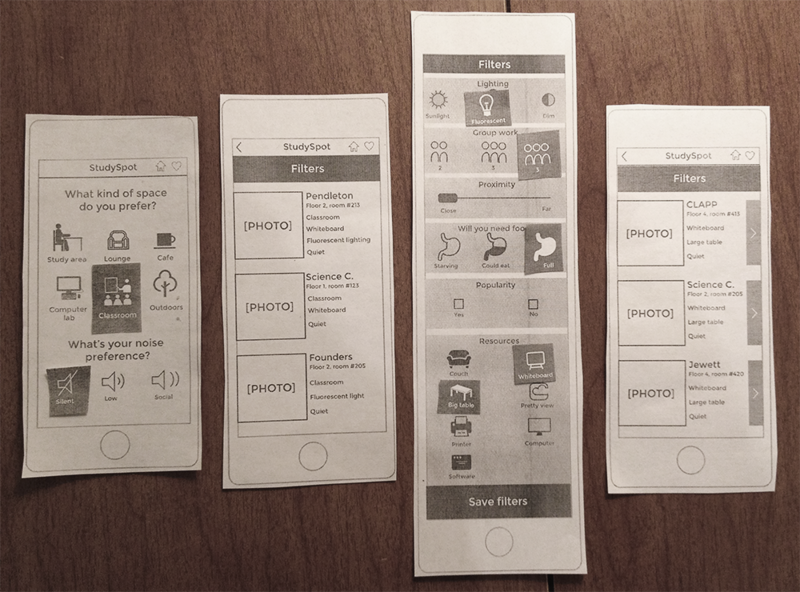 Based on the interviews, we’ve come up with potential tasks that users might have. This is a Hierarchy Task Analysis diagram of one potential task. The task is focused on finding a study spot for several people who want to work on a group project and need large tables and white boards for brainstorming. 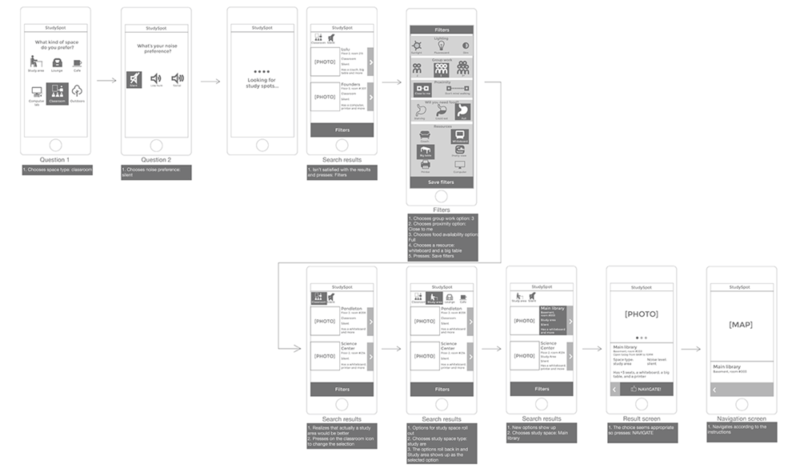 Having analyzed users’ desires and the task domain, we started wireframing. We came up with two designs. Both designs include an optional filtering option that contains specific preferences that some students might have. Design #1 presents the user with three starting questions (space type, noise level, and hunger) and allows to add more preferences under the “More” button in the lower left of the screen. 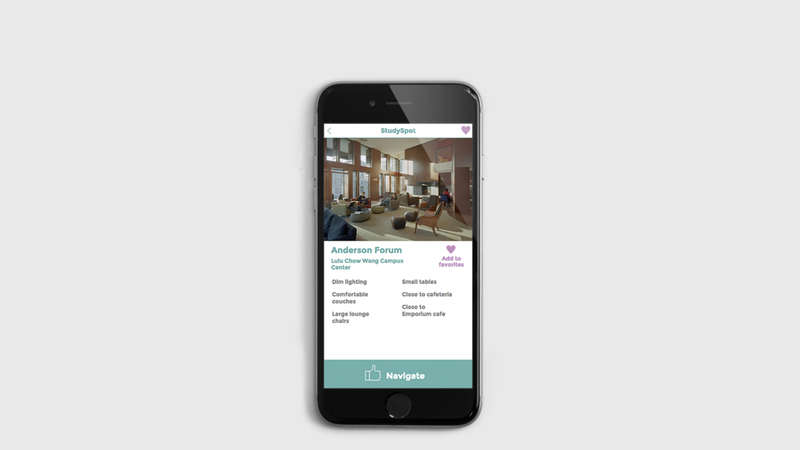 The app then generates one location that satisfies the selected preferences. From there, the user can either choose to navigate to the given location or press the “Refresh” button to see another suggestion. This design would might appeal to users who prefer to receive a single suggestion, instead of a going through a long list of options. Design #2 has only two starting questions, asking the user what type of space and what noise level do they prefer. The filter button appears on the search resul screen together with the list of generated suggestions. This design appeals to users who want to have more control and prefer access to more information.